camel colour (darker than caramel colour but lighter than chocolate colour). the top leather fringes can be removed to make it look like a different pair of shoes. 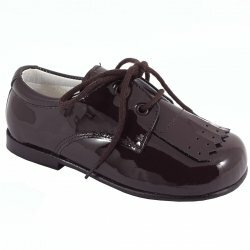 100% brown patent leather upper. made in Spain for Cachet Kids. size given in Europen continental (and UK size in brackets). Please see sizing guide on the left to menu to convert to US sizes.